Scarth Street in the City of Regina, Saskatchewan is a busy place on a Saturday as the market stalls are open with some of them displaying a variety of crafts. 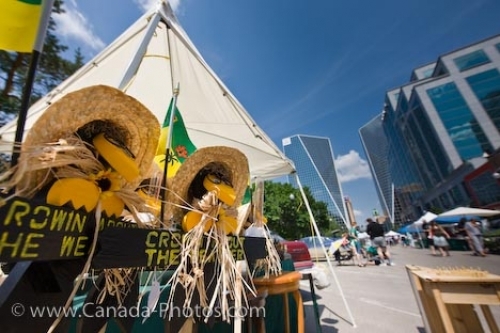 At this market stall, bright yellow birds with straw hats and bows stand on long poles which can be used in the garden as a decoration or to frighten off the crows. As May approaches, the market stalls open and the crafts people which have been working all winter, have prepared their goods and have them ready for sale at the Saturday market. Other stalls have fruit, produce, meats, cheese and baked items, all things people are looking to buy on a cheaper scale than the large grocery stores. In the backdrop, tall buildings tower above the Saturday market stalls where the local people in the City of Regina, Saskatchewan work throughout the week. Picture of people at the Saturday market stalls in the City of Regina, Saskatchewan where homemade crafts are found.